The case between the Senator representing Abia South Senatorial District, Enyinnaya Abaribe and Nigerian Military is to be heard today being 5th of Dec 2017. Abaribe is praying trial Justice Binta Nyako of the Federal High Court in Abuja to compel the Chief of Army Staff, Lt.-Gen. Tukur Buratai to pay him the sum of N10million for the psychological trauma he has gone through following extra-judicial self-help actions of the Army he said led to Kanu’s disappearance. In a fresh motion filed by the Senator through his legal representative, Abaribe prayed for, “An order of the court compelling the Chief of Army Staff, on failure to produce 1st defendant/2nd respondent, to pay to the court the sum in the bail bond earlier executed by the applicant on behalf of 1st defendant/2nd respondent. “An order of the court compelling the Chief of Army Staff to produce 1st defendant/2nd respondent before the court and or to explain to the satisfaction of the court the circumstance surrounding his whereabouts. Abaribe posited that “Out of patriotic consideration of assisting the judicial process to defuse the overheating already generated in the polity and with full belief that 1st defendant was carrying on his activities within the limits and confines of the Constitution of the Federal Republic of Nigeria, applicant offered to stand surety for him and entered into recognizance and executed the bail bond on his behalf”. 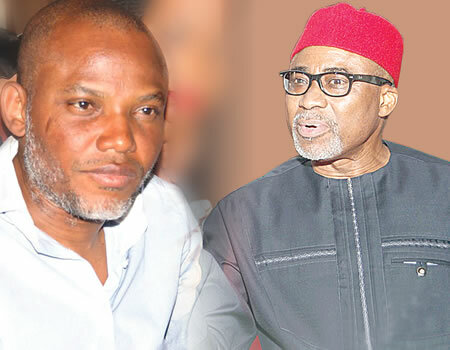 Abaribe further maintain that the only person who can give information about Kanu's whereabout is Buratai because he was the only person that saw him last. “As at the time of Chief of Army Staff ordered the deployment of his men and material to forcefully and violently invade and surrounded the town and residence of the 1st defendant/2nd respondent aforesaid, he had every knowledge of the pendency of this charge and that his conduct had the most probable effect of preventing the 1st defendant from attending court, to continue with his trial”. Recall that Nigerian Military led by Buratai laid siege in Umuahia between 10th - 14th September and invaded Kanu's residence on 14th September, 2017. And ever since the brutal invasion, nobody has seen Kanu not even his immediate family members. The current legal battle is the aftermath of ‘Operation Python Dance II’ initiated by the military to quench Biafra struggle. It was reported that the soldiers killed innocent women, men and youths in Aba, Umuahia and tortured pressmen working with Nigerian Union of Journalists (NUJ) Umuahia branch.